Notes, jottings and contributions relating to the life of Robert Schuster, one time headmaster of Ravenswood School, Stoodleigh, Devon. The following few paragraphs and the information contained are given purely to serve as background information on the family into which Robert Louis Schuster was born and brought up and there may well be the occasional inaccuracy. The subsequent collection of notes and jottings that follow on from this are not intended to form or constitute a comprehensive history of Robert Louis Schuster’s life.His only nearest surviving relatives are two nephews and a neice from the marriage of his sister Cicely Helen to Cecil Paul Longland in 1933, the youngest in his mid 70's, the oldest in his early 80's. Sadly all were reluctant to contribute whatsoever to this account. His niece,whilst conceding that her Uncle was, as anyone who had met him would undoubtedly confirm, a well liked and respected though private person,could see little if any benefit to anyone in my recalling any of his experiences.I am hopeful that the reader will disagree. RLS (as I will in future refer to him) was known by many but known about by few. Many are oblivious of his time as a teacher at schools other than the one at which they attended and were taught by him. In all RLS taught at four schools during his teaching career, interrupted only by wartime service and that part of his life was something that he only occasionally hinted at, often only to his pupils. It is recorded that RLS, whose family home at the time was Owen Farm, Mobberley, Cheshire,joined Sydney House at Oundle School in Northamptonshire as a Boarder in January 1922. Robert Louis Schuster entered Sidney Boarding House at Oundle School in January 1922 and was there until he left in July 1926. The image is of Sydney House 1924. He represented his house in rugby and cricket but in the early years was not much of a batsman, only scoring 1 run against Laxton House in the 1stinnings in the Junior House matches. Robert joined the rest of the School in the Choir as a treble for Bach’s Mass in B Minor that took place on 10th December 1922 and again in the Summer Concert in July.He was awarded a Form Prize for Mathematics in 1922 and a Greek prize in 1922 & 1923. He left Oundle in 1926 and immediately after leaving school entered New College, Oxford in the Michaelmas Term of 1926. He started to read for a Pass degree in History, and although he passed the first public exam (Moderations) in Trinity term 1927, he failed in three of his six Finals papers, namely B1 (English or General European History), B2 (French language and literature), and B6 (English literature including Shakespeare) in Trinity term 1929 and 1930, and so left without a degree. The college has no files for the students of the 1920s and is unable to shed any further light on why things went so wrong for him. In 1930 he spent three months at Tours, at the Institute of Foreign Studies and, in his own words ‘I have frequently travelled in many parts of France.’ Later in 1930 he appears to have secured a teaching position at the Wick School, Hove , Sussex under the Headmastership of G.S. Leach. There is minimal information on the school over the last 5 years of its existence (it closed in 1935), the history of it, such that it is, concentrates more on its earlier headmasters and pupils. The property was demolished shortly after the closure and we only know of this appointment through RLS’s WW2 Army Records. Coincidentally it would seem that not only was RLS out of employment through the closure of Wick School but G.S. Leach appears also to be seeking a position elsewhere and it seems they both headed in the direction of West Downs School, Winchester and were accepted onto the Staff, G.S. Leach having taught there before under the founder, Lionel Helbert before taking up headmastership of the Wick School in 1930. Much is known about this Preparatory School which was founded in 1897 by Lionel Helbert, M.A. Its History by Mark Hichens may still be available, ISBN 1 972795 76 5 and it is from this publication and also from a most helpful Nick Hodson, the School Archivist that we begin to glean our first snippetts on RLS and, coincidentally a little more about RLS’s former Headmaster at the Wick school, G.S. (Gussy) Leach. Leach had musical talent, he took over Choir Practice and introduced innovation into singing classes. He was a classicist and a notable musician, had a fine tenor voice but was a modest man and in his younger days had been a considerable mountaineer. RLS’s teaching career at West Downs is but briefly mentioned. The school sought, in 1940, for a suitable building in a safer location but the hunt proved extremely difficult and eventually they came across Glenapp Castle in Ayrshire. It was not by any means ideal. It was too small so temporary huts had to be erected outside and horror of horrors, there was a distinct lack of flat land for playing fields. In the advance party to Glenapp in addition to RLS was Harry Ricardo who had joined. 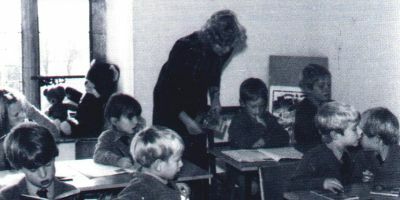 West Downs in 1938–a teacher with whom RLS would, in later years, attempt to realise their shared dream of running a Preparatory School of their own. West Downs became operational as a school in the Autumn term of 1940 and although the school settled down there, quite happily in spite of the restraints,this was not to be for long as on the 8th September 1941, a fortnight before the Autumn Term they were requisitioned. After extensive searches and a variety of hiccups the school was eventually relocated to Blair Atholl and six weeks after the requisitioning of Glanapp the school wa sinstalled at Blair Atholl ready for the Autumn Term. It was whilst RLS was at Glenapp Castle that he enlisted (or was he called up?) into the Territorial Army, with army number 7943736 and posted to the 57th Training Regiment, Royal Armoured Corps. This was not before both RLS and Harry Ricardo had aroused considerable suspicion with the local Home Guard with their foreign names. His colleague and friend was unfortunately a diabetic and was not called up for military service. Before we become involved in RLS’s wartime service we should discover more information about Harry Arthur Ricardo (HAR). Without getting too bogged down in family history it only suffices to say that HAR was one of four siblings from the marriage of Arthur David Ricardo and Rhoda Sophia (Nee Hewett). He was born in the district of Devonport. His father’s one time address was listed in 1911 as being the Deputy Superintendent’s House, Chatham where he was at the time a Captain RN. It is understood he later became an Admiral. Their latter family home was The Myrtles, Puddletown, Dorset and this is where HAR’s death was registered. Somewhere there is a connection between the greater Ricardo family and the Shusters at Minster Lovell. Between 1926 and 1928 the Reverend Clement Stuart Ricardo was vicar of Minster Lovell and lived there with his wife Mary having come immediately prior to the position from the Winchester area. It maybe that HAR & RLS were acquainted well before their coming together at West Downs School but I cannot discover the relationship between the Vicar and HAR’s Naval father. Nick Hodson fondly recalls as being called Smugglers & Excise men. Nick H also recalls that if HAR liked any essay you had written he got you to write a fair copy of it in a book he had kept since before the War. Nick H would love to track down the whereabouts of that book. 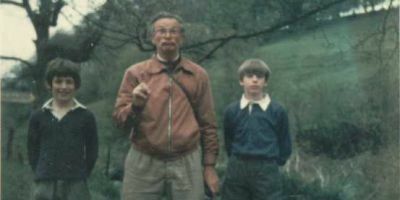 As previously stated HAR was a Diabetic, and there were occasions when he was quite ill. Nick recalls other memories, one being:- “Of HAR telling him about a Scout Jamboree he had attended. I think it was in the Netherlands. He was struggling to have a conversation with another scout leader he had met. I suppose they were trying to get along in Dutch, anyway, it took some time before they realised they were actually both English and so spoke the same language." ”Nick continues:- “He took no interest in Sports and Games. He also reintroduced Scout Camps. One project undertaken was the construction of a Log Cabin, the lads were required to collect the material whilst he did the building. There was a main room in Blair Castle, where we ate, had chapel services, were entertained by visiting conjurors, etc, and even had dancing lessons and our weekly choir practice. There was also a room with a balcony overlooking this great main room. This place was dedicated to Scout activities of various sorts. You went there to be examined in your Tenderfoot or your Second Class tests. HAR took notes about these passes, and later, after we had gone to bed, he would mark them in very beautifully on various suitable notice boards. It is recorded that at Glenapp Castle HAR occupied the room in which Bonnie Prince Charlie is said to have slept. One day, at Blair Atholl, HAR was Master on Duty. The whole school were on parade by scout patrols in front of him. There were letters to be handed out, and HAR called out names, and projected the letters rather accurately to the intended recipients. Then he appeared to go mad. He started loudly calling out various boys' names, including mine, but no letters were involved. Suddenly he recalled himself, and a woeful expression appeared on his face. He begged us all not to say anything about this event, because, he said, it would upset the Head Master. None of us understood what had happened, and we did not discuss it between ourselves. I still do not know what it all meant. He may have been landed when we were in the Highlands at Blair Atholl during the War with the duty of taking off-games boys for a short walk. What I do remember was that we used to play Scout Wide Games with great enjoyment in the mountains and forests of Blair Atholl, but I think their organisation was due to someone else. What I do remember was that as we were nearly all very competent at Semaphore and Morse, we could communicate with one another over great distances in the Highlands. But before we follow HAR’s teaching career any further there is the matter of the Second World War. According to Army Records RLS enlisted, aged 38, on the 24th of July 1941. Stated as being of five foot eleven and a quarter inches in height, a hundred and forty six pounds in weight, hazel eyes and brown hair. Posted to the 57th Training Regiment Royal Armoured Corp sat Warminster he passed S. Trade Test as a Driver Mechanic, Group D, Class 2 on the 12th December 1941 and was posted to the Middle East on the 8th January 1942 and posted to ‘D’ Tank Delivery Troop on the 27th May 1942. The 21st June 1942 was the day of the Fall of Tobruk. Royal Armoured Corps records report Trooper Schuster wounded by gun shot in the left leg. On the 20thJune, he was reported ‘missing’ and it was later confirmed that he had been taken Prisoner of War at Tobruk on the 21st June 1942. A Prisoner of War Postcard received by his next of kin (mother) in September 1942 confirmed his location at Camp No 75, P.M. 3450, Italy; a Transit Camp at Torre Tresca, Bari on the Adriatic in southern Italy. He was then transferred to Camp No 54, P.M. 3300 in Fara in Sabina, about 25 miles north east of Rome. It housed about 4,000 lower ranked British, South African and Gurkha prisoners, mostly from the surrender of Tobruk. Many prisoners escaped as the Italian Guards deserted when the Italian Armistice was announced on the 8th September 1943 and escaped into the Apennine Mountains. Shortly after the Germans took control of the camp and attempted to round up many of the POWs who had escaped from the camp and hold them in the camp whilst awaiting transport to Germany. With the Americans entering the War not only was the camp used as a collection and transit camp for Allied POWs captured by the Germans in the south, but also for the increasing number of US POWs that had been captured at Salerno and at Tarranto. From the camp prisoners were marched to Fara Sabina station and loaded into enclosed trucks, often cattle trucks and often packed tightly in, their footwear was often removed by the Germans as a deterrent, they were locked in the trucks and were then transported north to Germany. One such a train left Fara Sabina station on the 27th January 1944. It consisted of around 35 box cars, 2 freight cars and a passenger coach (for the German O.C. Troops and staff). The exact numbers of POWs on board the train is uncertain, most of the records having been destroyed in the action that followed but from statements given by survivors the numbers vary between 800 and 1200 and included British, American, New Zealanders and South Africans. On the 28th January 1944 on the second day of the train’s journey north the train was at Orvieto Station when the air raid alarm sounded. The Station Master refused to allow the train to proceed but his order was apparently over-ruled by the German Officer in Charge Troops. The train was considerably slowed to walking pace by the uphill gradient as it approached the bridge. At this time a group of twenty seven B-26 bombers from 441, 2, 3 & 4 Squadrons, 320 Bomb Group, United States Army Air Force commenced their bombing of the bridge. This was not the first time the USAAF had attacked the bridge which carried the main railway line from Germany to the south of Italy and along which travelled men, munitions and supplies for the two fronts at Anzio and Cassino. Much evidence of previous attacks on the bridge was clearly visible to those POWs able to see out of their box cars. The electric loco was about halfway across the bridge when the first wave of bombers came over the target area. The first wave caused no direct hits on the bridge or the train but the blasts caused some box cars to burst open, allowing the POWs to escape. A second wave also did not cause direct hits but caused the death of perhaps a hundred men. The third wave scored direct hits on the bridge, causing 4 box cars to be thrown from the viaduct and further death and destruction and other parts of the train were blown off the bridge and sections of the bridge were destroyed. The fourth wave caused the deaths of, it was suggested, some 300 men mainly through the explosion of delayed action bombs. It was stated that the train was unmarked and the attackers believed the train to be carrying German troops. Escapers from the train whose outcome at the time was unknown included Trooper Schuster, his escape was evidenced by a Private C F Morris who saw Schuster escaping from the damaged train on foot. None of the POWs had either shoes or boots and it was a bitterly cold day. In later life it was noted that RLS still appeared to suffer from the effect the escape had on his feet Private Morris eventually managed to rejoin Allied Lines and reported to the Escape Commission on the 29th June 1944. Morris’s account is reproduced with many others in Janet Dethick’s book. Unfortunately Trooper Schuster’s escape and his subsequent experiences have never been established and there is no record of a report ever having been submitted to the Escape Commission. There is a suggestion in the History of West Downs School that he escaped recapture dressed as a Catholic Priest but there is no evidence of this and the statement in the same book that he was captured in Italy is incorrect. RLS, who taught Latin to his pupils, had language skills and this may have stood him well during the six months that he evaded capture. Other snippets about his experieces will get mentioned later on. As a result of the bombing by the Americans of the Prisoner of War Train on the bridge Churchill and Roosevelt agreed to keep the matter Top Secret as it contained a transcription of a German message that had been intercepted and deciphered by the use of Enigma. This most regrettable incident was eventually declassified by President Clinton in 1996. A War Office Memo dated the 20th June 1944 stated that Trooper Schuster was ‘now reported to have reached Southern Italy and is in Allied Hands – he will be brought back to the UK as soon as suitable transport can be arranged.’ He disembarked in the UK on the 6th July 1944 and was posted to the R.A.C. ‘Y’ List on the 7th. He was attached to No 1 ASC Matlock on the 18th July and posted to 57 Training Battalion R.A.C. at Catterick a month later. He was awarded the Africa Star. On the 13th January 1945 the Lieutenant Colonel Commanding the 57th Training Regiment deemed him suitable for the Army Educational Corps. RLS at the time described his qualifications by stating “I have spent 12 years teaching French, English and Modern History, in which subjects I take great interest. (I) have also some experience of Librarian work and debating societies. After leaving the University, I spent 3 months at Tours at The Institute for Foreign Studies and have frequently travelled in many parts of France.” However, the War Office Selection Board decided on the 21st February 1945 that he was ‘Unsuitable.’ He was promoted to unpaid Lance Corporal on the 16th March 1945. On the 21st January 1946 his OIC stated that “During the 12 months with this Regiment after release from P.O.W. Camp this NCO has proved himself to be an outstanding instructor in map reading. His methods, enthusiasm and manner commands great respect and I have great confidence in Schuster” On the following day he was posted to the ‘Y’ List and on the 17th April 1946 he was released to the Royal Army Reserve on completion of a total of four years and two hundred and sixty eight days military service. Shortly afterwards he returned to the family home at Minster Lovell and apparently thence to teaching at West Downs School, but not for long! Just when exactly, even to the year, did RLS and HAR decide to set their sights on running a preparatory school I cannot discover. I would guess after RLS returned to West Downs after the war. Digging around on the internet (what would one do without it?) we find that HAR was educated at Sherborne School and left in 1930 and thence to Trinity Hall, Cambridge. A notation on the Sherborne School records suggests an interest in rowing and his involvement in Trial Eights as a Cox; there is no mention of Academic achievement. He first held a position as a master at Rossall School, Fleetwood (1933 – 1937, Junior School and Art Master). In 1937 he moved to Raitcliffe School, Englefield Green, Egham, Surrey and sometime in 1938 to West Downs School. Ravenswood school was founded by Durbin S. Sparke M.C., BA (Repton & Emmanuel College, Cambridge) and his good wife probably in 1921. Its first location was at ‘Ravenswood’, Cliff Road Paignton (from which the school took its name). 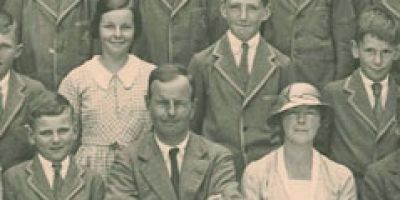 The earliest school photograph relates to the summer of 1922 and shows a collection of 14 pupils, all wearing the same sort of blazer I was kitted out with in 1953! It seems the fledgeling school expanded quite quickly, and soon outgrew the constraints of the property in Cliff Road, there being 34 pupils at one time during 1926. It is understood that searches for a new location were successful during 1927 but it still didn’t stop an advert appearing in the Western Morning News for a second Housemaid, At Once!, Uniform provided etc. Apply Mrs Spark, Ravenswood School, Cliff Road, Paignton. No school photograph exists for that year but perhaps arrangements moved swiftly for the 1928 image shows the school definitely at Stoodleigh Court, near Tiverton and the school, known by all now as Ravenswood School, remained there until the school’s closure in 1991. In 1929 Mr O.F. Huyshe, M.C., B.A. (King’s School, Canterbury, and Keble College, Oxford) makes an appearance on the School Photograph and his name appears on advertisements for the school under Mr Spark’s name implying their Joint Headship. With regards to the school building, known as Stoodleigh Court, it was built in 1883 by Sir Ernest George and H E Peto for T Carew Daniel, possibly on the site of an earlier Manor House. As a listed building it is described as being of a free mixture of Elizabethan and Old English style. In 1925 the estate was eventually split up and put up for auction, the previous owner having been declared bankrupt. The ownership of the principal buildings passed to Ravenswood School in 1928. Mr Sparke looked to be in his middle twenties when he formed the school in Paignton and probably was well into his fifties by the late 1940s, quite what age Mr Huyshe was then I don’t know, he looks older. Perhaps there is only so much one can take when it comes to teaching youngsters, especially if they are boarders, and possibly by 1947 they had either both had enough, or for some other reason they decided to give up the reins. 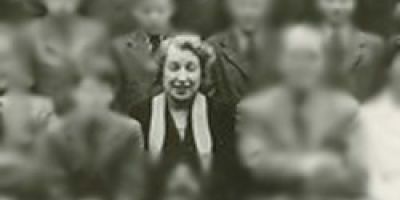 The last school photograph in which they appear is 1947, in the 1948 edition their places are taken by Mr H.A. Ricardo and R.L. Schuster, the head boy that summer being Chris Allanson-Bailey. I doubt if anyone could have predicted the unfortunate event that was looming over the horizon. Maybe HAR had an inkling as he had, as we know, suffered from Diabetes for quite some time. One recollection is that HAR became blind through the diabetes as is sometimes the case, maybe his vision just became impaired but unfortunately his death came before the year was out. There is no record of HAR ever having married, nor indeed did RLS. In 1950 a Major Hunter joined the staff as, presumably, Joint Headmaster but by Easter 1952 he had to retire as this brief extract from the Ravenswood Chronicle confirms:- “We all very much regretted that Major Hunter had to retire very suddenly for reasons of health, at Easter”. Fortunately RLS had the assistance of his sister Margaret Oxlade as Housekeeper, though I’m sure her responsibilities extended beyond those duties and the burden of control was shared. Margaret was about a year older than RLS. Eric Robert Oxlade was born in India in 1898. A first marriage by him to a Miss Stradling in 1924 appeared to have gone awry and he married Margaret in 1933/4. They had a son, Tulloch, who was born in Minster Lovell in 1940 – he had a short life, he died in 1980. 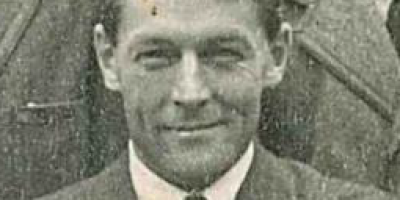 He was at Ravenswood with his mother and was educated there at least between 1948 and 1952 as was RLS’s nephew, William Paul Longland from 1951 through to 1954. I vaguely recall Tulloch (who went on to Kelly College) and also William Longland as our times at Ravenswood partially coincided. I was there from 1953 – 1958. William later contributed some images of school life in the 1950s to the school in September 1990 but was far less charitable when I approached him about his Uncle in 2014 and returned my correspondence (though I feel sure he read it!) without comment. Although Mr Oxlade occasionally turned up at Ravenswood it would seem Mr Oxlade made his own way in life. He remarried, this time to a Mary Stephens in Witney, Oxfordshire in 1947. Mrs Oxlade, much liked by many, lived originally in the main building in rooms, or flat above the Music Room, it may be this arrangement altered when RLS’s mother, Helen Selby Schuster, moved to the school complex in 1953 from the family home at Vine Cottage in Minster Lovell taking a mews flat above the stables. RLS and his sister Margaret shared much of their adult life together even after Ravenswood as we shall see. The late forties and early fifties produce the first images of RLS that I have managed to track down and they confirm the image conjured up by his service record as a tall lean person. In fact the years at Ravenswood come up with almost the only images we have of him, apart from the ubiquitous School Photograph. Youngsters at the school in the 1950s tended to note the different types of cars the staff drove, we have suggestions that RLS drove an Armstrong Siddeley. Certainly in 1954 RLS referred to the ‘Decayed Gentry’ in the courtyard of the school however he was not talking about the teaching staff but the vehicles which, at the time, included various elderly jalopies including a Rolls Royce, the Bentley (that was Mr Leathly’s), the Talbot (which belonged to Miss Nicholson) and a Fiat. study quite frequently and for the wrong reasons (I don’t think I ever was outside the study, no matter who the Headmaster was, for any good reason!) awaiting the inevitable. I feel that of the three Headmasters I knew, whilst I always seemed to be in some scrape or other, he was, in hindsight, the most liked and respected. Under his Headmastership we all seemed to be on quite a long leash. Punishment did take the form of caneing and I have it on more than one account that RLS had a strong right arm but we all knew the rules. Here we are concerned only with RLS and his time at Ravenswood. Later we will see how often this view was shared. Two views of Normandy Hill Farm taken post 2000. The last photograph of RLS in a whole school format was 1955 and the Chronicle for that year, dated December gives no inkling whatsoever of any impending move. It is with thanks to a John Squiers who provided me with the information that RLS moved in to Normandy Hill Farm, Normandy, Surrey on the 7th September 1956. It transpired that John only lived across the lane from Normandy Hill Farm and had done a lot of historical research on the property. The farm is on Normandy Common, about 5 miles west of Guildford. One of the earlist references to the property is back in 1664. The premises were divided into two, Mrs Oxlade and son, RLS and his mother all accommodated within the property. Aldro School was, and still is, located at Shackleford, near Godalming, just to the west of the A3. Charterhouse School being almost equidistant to the east. Its roots go back to Eastbourne where it was founded in 1877. It moved to its present location in 1942 – the history of the school can be read here http://www.aldro.org/about/history . Unlike the three other schools RLS taught at, this school is still going strong and its pupil numbers are around 220 and running to nigh on full capacity. Although I have acknowledged at the end of this ’article’ all those who have contributed I would like to acknowledge here the help and encouragement of Vivien Gillman, one time Bursar at Aldro (94 – 08) and Secretary and Treasurer of the Old Aldronians. As yet I have no specific information as to when RLS took up his teaching post at Aldro. In fact I doubt if many from Ravenswood ever had an inkling as to where RLS had moved on to, let alone aware that he continued to teach. I expect there was a similar attitude amongst West Downs’ staff and pupils, once he left he drifted off the radar. It appears to work in reverse as well as most at Aldro were probably oblivious as to where RLS had actually come from and with RLS being a somewhat private person, were unaware of his previous status as a Headmaster of a Preparatory School. It is said that at Aldro your position within the school staff is reflected in where you are positioned in the School Photograph. The photograph above was was taken in 1964. I cannot say for sure when he took up his post at Aldro though the extract below suggests it to be 1956. “I was at Aldro School from 1956 - 1961 and Mr Schuster was my Latin teacher. He stands out as my very best teacher at Aldro, which was a very good and happy school. Latin is not the easiest subject to make interesting, but RLS definitely succeeded, and he encouraged a couple of us in our interest in coin collecting and archaeology. I've attached a letter from him to me, probably written in 1960 (possibly 1961), which probably says it better than I can. I can't add much to this, but he was a remarkable man in character and activity and made a lasting impact on me, for which I am very grateful” T.B. The text of the letter I have reproduced in print as, to be fair, it’s not the easiest of script to read! Many thanks for your letter which I didn’t answer as I was just off on a visit to Cheltenham. On the way there we looked in at the Cow Down Excavations and was shown around by the Professor & his wife. Miss Nicholson told me about your visit there. In the afternoon she motored me over to Bath, where we had a look over the Roman Baths. What do you think of the enclosed rubbings? I am thinking of making a really good catalogue of my coins this coming winter, illustrated by such rubbings. All you need is a thin piece of white paper, slightly damp. Press well over the coin and then pencil it over. Afterwards I sprayed it with a setting liquid (which crayon artists use) to prevent smudging..
I’m glad you enjoyed Dorchester, I’ve never been there, but must go sometime. Tomorrow I’m off to N. Wales. Lets hope the weather will be fine. “Mr Schuster taught Latin - a wry and detached man with beautiful handwriting. My chief memory of him was of him quietly using a toothpick at lunch, and trying not to be seen by the Headmaster." I’ve hastily re examined RLS’s handwriting in the letter I have just re written – I have to say I would disagree with the last comment! At Ravenswood RLS owned an Armstrong Siddeley, at Aldro ? . . . . . . . .
By every account, and this is confirmed in the images of him, RLS was a tall lean man and with that thought and bearing in mind the following images (for I am unsure which version J.P. is referring to, those of you with WW2 memories may well know the difference between a Heinkel and a Messerschmitt !!) I challenge you to read the following without at least a hint of a smile forming! “This is fascinating! I remember Mr Schuster very well and would like to add a couple of thoughts. I remember him as a very kindly and gentle person with a permanent half-smile, and I think he must have had a good sense of humour. He taught me Latin I think, as suggested in the account. He did indeed live at Normandy (which to us boys was about as far away as the other Normandy) and drove a Messerschmitt bubble car, which opened at the front to our extreme amusement. We used to love watching him get in and out. I remember his story of how he was trying to get up the hill to the Hogs Back after a snowstorm and just about made it to the top before sliding back. Apparently the bubble car wasn't much good in the snow. I used to sit at "his" table at lunch and the only time I can remember him losing his cool was when I was swinging my legs under the table and inadvertently kicking him without realising! “I recall Mr Schuster as being a popular Master being older than most of the other staff. At the time he drove a “Bubble Car” which had three wheels and which was entered by a front facing door. I seem to recall that he might have had an accident in it skidding off the road into a ditch on the road between Shackleford and Liddling Farm on the way to Puttenham. The car suffered damage and Mr S suffered a broken collar bone. I am not sure when he left Aldro but have the impression it was around ’67. J.D. 63 - 68. I can only guess but I imagine RLS and his mother were quite close, they had been living very close to one another at Ravenswood and she shared the acommodation at Normandy Hill Farm. On the 10th January 1963 at Normandy Hill Farm she died. She was buried at St Marks Wyke, Normandy. Her grave is unmarked but an inscription was added to her husband’s tombstone in the graveyard at St Kenelms in Minster Lovell. Thank you for your enquiry regarding Robert Schuster. I was aware you might be getting in touch with me since Vivien has spoke about you to me. I was a pupil at Aldro between 1962 - 1967 and it was during those years that I knew Mr Schuster. or 'Schooey' as he was known! I do not recall him leaving Aldro before the time I left, so I guess he must have retired about 1968. Mr Schuster was a wonderful man: warm, gentle, fair and quietly mannered. He was enormously respected and liked by all pupils for he was very interesting and extremely modest about his war years as a POW in Italy. He taught me Latin - under sufferance I fear for it was a subject I had difficulty coming to terms with - but he and I struck up a healthy 'friendship' out of the classroom which kept me at bay from any difficult piece of Latin translation or having to answer awkward questions well beyond my ignorant and limited knowledge! I was a keen games player and one of my enjoyments was playing golf; we had a short golf course at Aldro and during 'free time' I would play a few holes. Schooey enjoyed golf as well and on a number of occasions when he had a spare moment or two and saw me making my way out with a couple of clubs, he would ask if he could join me for a few shots. We would play something like 'closest to the pin' seeing as time was limited. Being awful at a subject he taught but having a common interest in hitting a few golf balls around gave me some credit with a master who was a wonderful man. He did tell me about his war years but my memory is rather sketchy now. I seem to remember he was in North Africa, that he was captured and made a POW in Italy. I thought - and here I could be quite wrong - that at some time he had escaped before being recaptured. My reason for this is because he said that he had kept a small notebook of addresses of people (civilians) who had helped him on the run ie shelter, food etc with the purpose that at the end of the war he would like to contact them and thank them properly for their kindness. Now this notebook became a real problem for him, as I believed, he was captured and back in the hands of the Germans and somehow he had to keep the notebook hidden for fear that if it was found those who had helped him would be in mortal danger. The POW camps had regular searches and when this happened he would hide the notebook or rather 'grip' the notebook in his palm with the underside of his thumb (difficult to explain in words this grip!). He was successful with preventing the notebook falling into the wrong hands but as to what happened to that book afterwards or whether he ever got the chance to revisit those who helped him, I cannot recall. Schooey knew I was very interested in true WW2 escape stories since I was often reading the incredible accounts and talking to him about them but he was quite reticent to talk about his own war time experiences and so I felt very privileged to hear his account when I did. I rejoined Aldro as a member of staff in 1976 and stayed there until July 2008! I never had the opportunity of meeting Schooey again.....a great pity. much to the disappointment of the Chairman of Governors - he tried as hard as he could to persuade me to continue and intimated to me that we were top choice to take the school on! Within a couple of years the school closed - thankfully neither my wife nor I were at the helm! A couple of other small memories: Schooey had a beautiful gold fob watch which struck the quarters...the striking mechanism could be turned off! When being on duty and to pass the time away he would challenge pupils to guess how much 'change' he had in his hand in his pocket; should they guess correctly when he opened his hand, the pupil could have the money... I never knew anybody who won at this game! I do keep in touch with a few contemporaries of mine who may well remember Schooey better than me; should I find Vivien has not contacted them I will certainly pass on your request for any information regarding your enquiry. I have also suggested to Vivien contacting a couple of elderly staff who were with Schooey at Aldro, but I doubt very much whether they are familiar with e-mail but we can still make enquiries on your behalf. Incidentally, I don't recall that Schooey was ever Deputy Head or Senior Master but I could be wrong! I hope some of the information above is of some help to you; I fear it isn't but should I remember anything else I will let you know. I hear from Vivien Gillman of Aldro School that you are seeking information about Robert Schuster. I was at Aldro, 1959-1964, and remember him very fondly. No doubt he was a good teacher of Latin, but I remember him primarily for his tales of his time in North Africa. They seemed like a real-life version of the ‘War Picture Library’ comics which we were only permitted to read if ill in the sick-bay! Several other well-liked masters at that time also had remarkable personal stories to tell of their wartime experiences. Boys of that age like to hear the gruesome details. I remember him talking about emerging from his tent after a sand-storm to find that he was in a minefield – the mines had been exposed when the sand blew away. I also remember him talking about a sand-storm which blew the sand off some lines of buried bodies from some previous battle. He did his bit as a cricket umpire, but I guess all members of staff did. Like most of his colleagues, he tended to wear the same tweed jacket with pockets full of cigarettes which contributed to the haze of smoke in their common room. I am not sure how this would fit in with the narrative you have to date, but my father (DoB 1916) , who grew up in St Tudy on the edge of Bodmin Moor, was friendly with Mr Schuster, saying that of course our family knew a member of his family in North Cornwall, his uncle? I vaguely remember that there may have been some connection to the clergy in that area? My over-riding memory is of a very nice man with an understated sense of humour who was not frightening to the boys. He was the best sort of prep-school master of that period. I guess that the best teachers I had at that time would all be unqualified to teach today. I never heard about his life before or after Aldro, and would very much like to see the eventual outcome of your researches. And one last comment from his days at Aldro for in 1968 onwards it appears he moved (and presumably retired) to Wilton outside Salisbury. Along with Francis Hudson and Crispin Hill, Mr Schuster was one of Aldro's "greats". They were men who commanded a lot of respect from pupils. He had a very calm, firm, but gentle manner. I cannot recall his ever having to raise his voice. He had a great sense of humour, and outside of the classroom a glimmer of a smile was never far away from the corners of his mouth and a bit of a mischievous twinkle in his eye. I seem to recall, that like Mr Agg Large he enjoyed the occasional cigarette. He tried very hard to teach me Latin. As to his wartime experiences, I seem to recall that his escape from the POW train, when American planes attacked, he had no footwear, but had to run for his life in bare feet, the injury from which he never fully recovered. By this time RLS is in his sixties. RLS moved to The Yarde House, Primrose Hill, Wilton with his sister Margaret. This arrangement apparently did not work out too well, whether Margaret moved out and he stayed or vice versa is unknown. We do know that he moved to stay with a Mr Ayres in a house called ’Bridge End’ off The Avenue in Wilton. According to Robin Hall this was next to HQ Southern Command, which, in time expanded to become HQ UK Land Forces. The army expanded the site, taking over and knocking down Mr Ayres’s house in the process – I offer this as an excuse for being unable to supply an image of the property! Not a great deal about his activities in retirement in Wilton is known. He attended the Wilton Parish Church but was neither a Church Officer nor on the P.C.C. “I remember Robert showing me the map and explaining how he had travelled from south to north in Italy with the help of his classical Latin and of Italians who were at risk of their lives when offering their own help. At first he had the equivalent of a small allotment in my parents' large garden but often took my mother, who by then was disabled, to concerts of classical music which - in contrast to my father - they both enjoyed. After my mother's death my father found living alone almost more than he could bear and Robert moved in for almost ten years until, when my father was in his nineties, things became too difficult. I remember them both at breakfast, my father doing the Times crossword and Robert the Telegraph; they would then swap if unfinished. I last saw Robert not long before his death and have always remembered the occasion since, because I was late leaving the hospital, I ate at the local Macdonalds. I hope this is of interest: I certainly was very fond of him. Lady J.B.
To some this whole account may appear to be a pointless exercise. I take a different view and hope that the majority of people who read this, most of whom at some time in their lives had contact with him, will realise, if they hadn’t already, what an inspirational, respected, private and well liked person Robert Louis Schuster was. They may also discover, possibly for the first time, about the events that occurred at Allerona on the 28th January 1944. An horriffic and tragic incident from which RLS fortunately managed to escape, and avoid recapture. Something he only infrequently mentioned and seldom in any detail. I should finally like to thank all those who contributed articles or information or assistance to me and without such I would have been unable to have written this account. They are listed in no particular order. 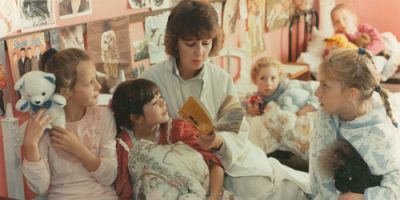 Judy Middleton (Wick School), Nick Hodson (West Downs School), Mark Hichens’s Book ‘West Downs’, Sue Honore (Oxfordshire F.H.S. ), Tom Smith (Minster Lovell), Jane Kinrade Dethick ‘The Bridge at Allerona’, Chris Kemp (Camp P.G.54, Italy), Roger Stanton (Escapelines Memorial Society) Mike Sampson (Blundells Archivist), Stephen Forge (Oundle Archivist), New College Oxford, Vivien Gillman (Sec’ty Old Aldronians), Mark Granger (OR), Peter Holladay (OR), Christopher Holladay (OR), Mark Shelmerdine (OR), John Batten (OR), Felicity McCarthy, John Squiers (Normandy), Lady Jane Berrill, Tom Biddulph, Paul Pilkington (OR), Philip Cooke (OR), Richard Mackie (OR), Robin Hall (Wilton), Ian Norris, Peter Mitchell, Beryl Hudson, David Kemp, Joan Penny (Tiverton), Adrian Watson, Humphrey Davis, Jerry Ponder, Julian Duffus, Jonathan Bailey, Johnny Pott, C Allanson-Bailey (OR).